GAIA'S DAUGHTER #3 was inspired by a very Spiritually Oriented woman who has dedicated her life to being of service to people in crisis. She is one who truly walks her talk. See if Gaia's Daughter speaks to you, or brings to mind someone who lives their life in Holy Service and Devotion....perhaps your Self? The inner structure of Gaia's Daughter #3 is made with with the beautiful 'Lacy Moss' (lichen), collected in nearby Monterey, and is supported by several sticks, one collected from the riverbed in Yosemite Valley, the other from a Coastal Cypress, complete with it's seed pockets. Her 'hair' is moss collected locally in Ben Lomond. Her inner garments, including her 'cloak of many colors', are a fiber collage of many 'rescued' silks, designer fabrics, and yarns, perhaps representing the countless lives You, or some you know, have touched. Her flowing skirts are beautiful repurposed designer sample fabrics. And her wraparound cloak is a vintage crochet doily, symbolizing the gift of caring that is woven together throughout all time. 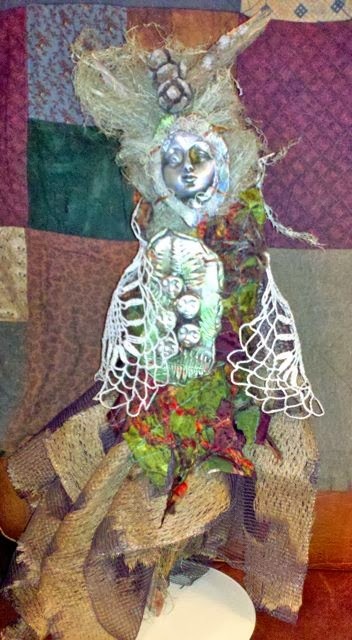 Her crochet cloak seems to cradle the assemblage of faces she holds dear. Gaia's Daughter's face.... this particular cabochon kept speaking to me, that she wanted to grace this doll. I think, because she is sturdy, substantial, with an elegant spiritual gracefulness, all of which depict one who walks the Spiritual Path. I especially like her timeless gaze, as though she is watching over us all through eternity. 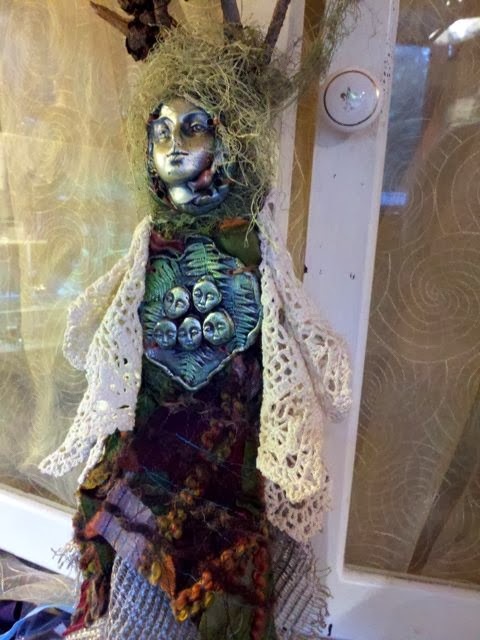 Her BREASTPLATE: I include a breastplate on all my spirit or wisdom dolls. Traditionally, a breastplate is a device worn over the torso to protect it from injury, as an item of religious significance, or as an item of status. A breastplate is sometimes worn by mythological beings as a distinctive item of clothing. 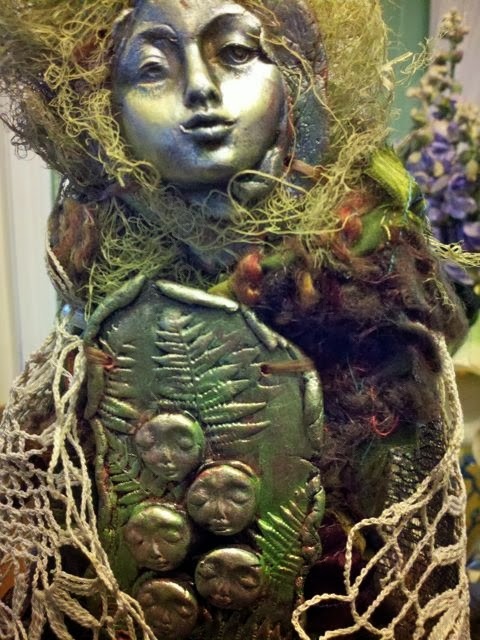 In this case, Gaia's Daughter's breastplate depicts the countless lives you, or someone special, have touched, represented by five faces, cradled in Nature's womb of ferns. 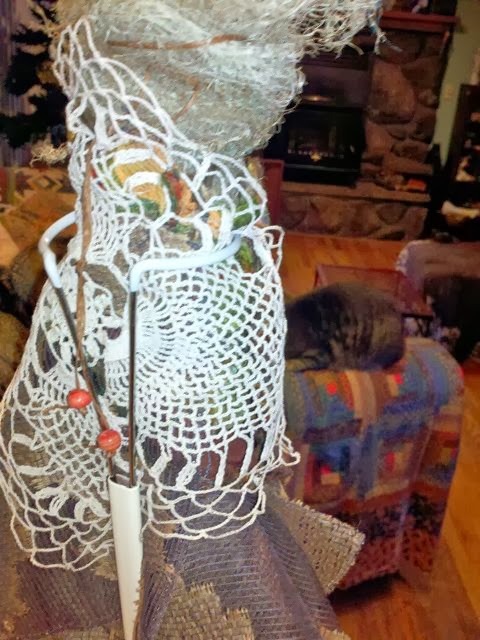 Perhaps symbolic of our Sacred Grandmothers passing on Ancient Wisdom to our Sacred Granddaughters. Nestled in a cocoon molded in a bed of ferns, the symbolic meaning of fern is magic, fascination, confidence, shelter, discretion, reverie and a secret bond of love. And the metaphysical meaning of the number Five draws our attention to the wonder of life, and beckons us to appreciate the perception of chaos all around us. 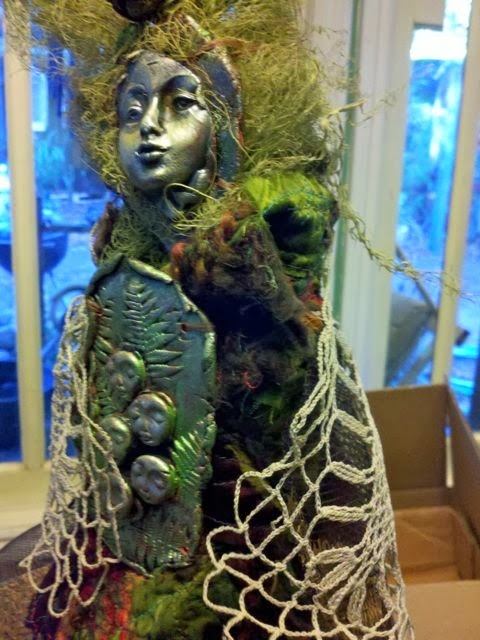 Just a bit more about my Spirit Wisdom Dolls... I've worked with polymer clay but find greater comfort creating with earth-friendly terracotta clay. Also, We have a nearby 'fabric rescue' center (Fabmo, located in Mountain View, CA). Fabmo saves the lives of so many amazing designer fabric samples, offering them to artists who will give life to these samples previously destined for the landfill. 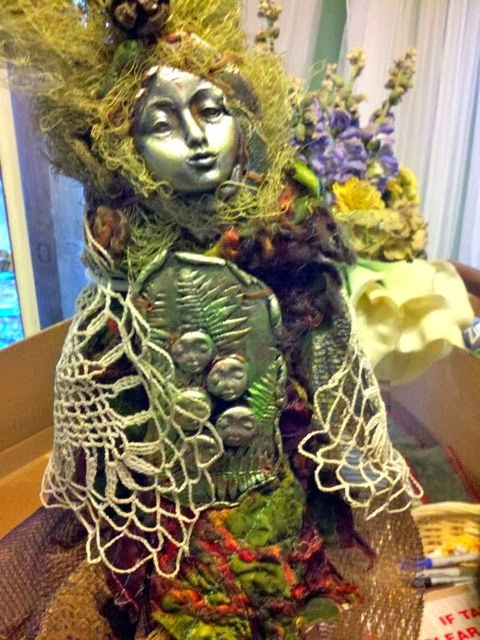 And so, while most of my Spirit Wisdom Dolls are organic, collected in nature, I feel that by using these 'rescued' materials, we are utilizing the gifts that the Bountiful Universe so abundantly gives. Hello dear friends.... 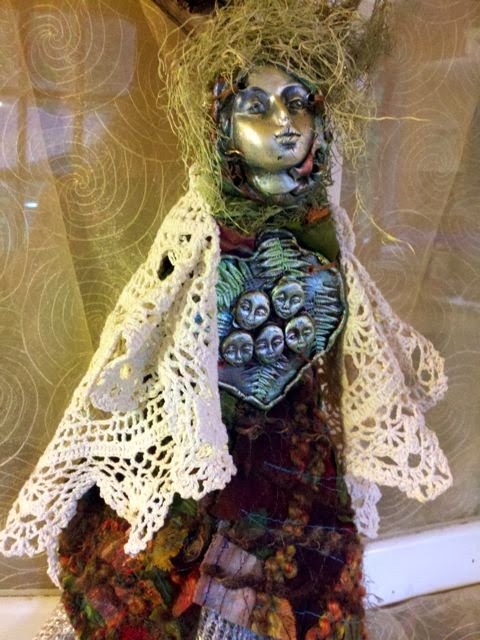 I just wanted to share this very special Wisdom Doll I made for a very dear person, Diane. Diane is a person has dedicated her life to be of service to people in crisis. I became inspired to create this 'Gaia's Daughter' after our conversation about her visit with the Dali Lama and Thich Nhat Hanh and I came to the realization that Diane really walks her talk, and is living a life of service and devotion. The inner structure of Gaia's Daughter is made with the beautiful 'Lacy Moss' (lichen), collected in nearby Monterey, supported by several sticks, one collected from the riverbed in Yosemite Valley, the other from a Coastal Cypress, complete with it's seed pockets. Her 'hair' is moss collected locally in Ben Lomond. Her inner garments, including her 'cloak of many colors', are a fiber collage of many 'rescued' silks, designer fabrics, and yarns, representing the countless lives Diane has touched. And her cloak is a vintage crochet doily, symbolizing the gift of caring that is woven together throughout all time. And now Gaia's Daughter's face.... this particular cabochon kept speaking to me, that she wanted to grace Diane's doll. I think, because it is sturdy, substantial, with an elegant gracefulness, all of which depict Diane. I especially like the timeless gaze, as though she is watching over us all through eternity. And... Her BREASTPLATE: A breastplate is a device worn over the torso to protect it from injury, as an item of religious significance, or as an item of status. A breastplate is sometimes worn by mythological beings as a distinctive item of clothing. 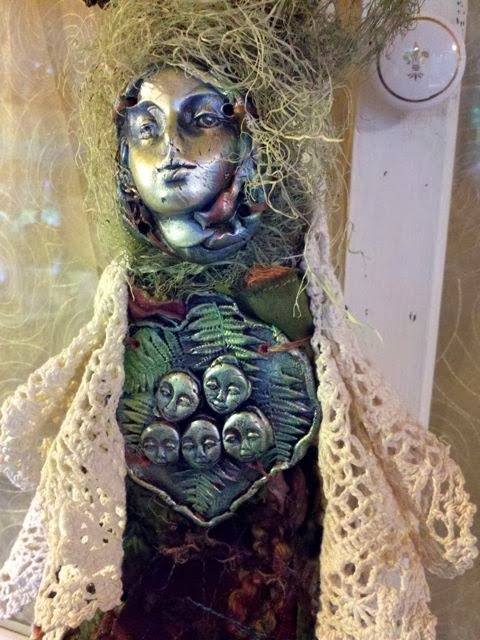 In this case, Gaia's Daughter's breastplate depicts the countless lives Diane has protected and touched, represented by five faces, cradled in Nature's womb of ferns. The symbolic meaning of fern is magic, fascination, confidence, shelter, discretion, reverie and a secret bond of love. And the spiritual meaning of Five draws our attention to the wonder of life, and beckons us to appreciate the perception of chaos all around us. I just feel so honored that 'Gaia's Daughter #2' came to me to gift to Diane, to let her know she is seen, appreciated, and loved. She has really made a difference in the world.